Coffee is a medicine. Because the ritual of coffee is so embedded in our daily lives and it's often consumed in large quantities with milk, many of us tend not think of it in this way. However, when we ingest the roasted seeds of the Coffea Arabica fruit the physiological effects are undeniable. The caffeine that accompanies our bitter brew suppresses a neurotransmitter in our brain called adadenosine. This ultimately makes us more alert, helps us focus our attention and concentration, and can even boost our energy and mood. For a lot of us coffee is an unconsciously, self-prescribed daily medication (... which can be an addiction). There's a very tangible reason why so many of us nod in agreement with the phrase "but first coffee." Life can be hectic, work can be stressful, relationships can be challenging, the news can be overwhelming, social media can fry our brains (at least thats what it feels like), and unfortunately drinking coffee when we are struggling to manage it all is like adding fuel to the fire. It doesn't help. In fact, coffee also stimulates our adrenals which are two small glands located at the top of our kidneys. These glands are responsible for our fight or flight responses and secrete hormones like adrenaline and cortisol in response to real or perceived threats. Caffeine is known to increase our cortisol secretion even when we are at rest. In other words, perhaps coffee isn't the right medicine to be ingesting when we are struggling to manage our stress. So, if and when we find ourselves burning out, why not give the coffee a rest and call on the wisdom of other plants to help our bodies unwind? In the same way we use coffee to get us going —maybe we can utilize different plant material to elicit the physiological responses we need to regroup, settle down, and recover. Hippocrates said it best, "Let food be thy medicine and medicine be thy food." 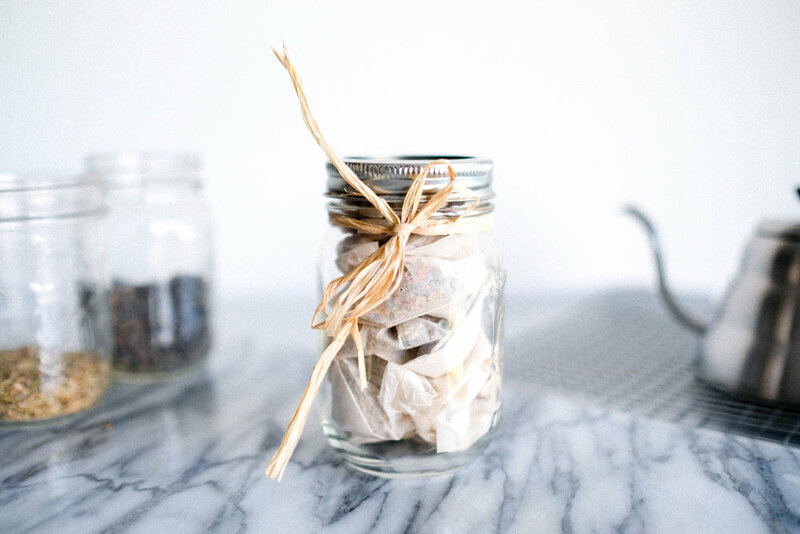 With this in mind, I hope you enjoy my easy, incredibly aromatic, and delicious recipe for Stress Free Tea. traditionally used for: calming nerves, relieving tension headaches, aiding sleep, relaxation, and reducing alertness. * For best results use culinary lavender. It is sourced from sweeter tasting varieties. Do not use lavender which isn't intended to be ingested as it may be covered in chemicals for preservation. traditionally used for: lowering blood pressure, fighting off colds and reducing inflammation. *It's very important to use organic oranges and wash the peels well before use. This tea won't be stress free if it comes with a dose of pesticides! traditionally used for: freshening breath, aiding digestion, relieving heartburn, regulating female reproductive cycle. *Some people are sensitive to fennel. It also contains natural estrogens. Pre-heat oven to 200 °F, and place rack in top position. Thoroughly wash and dry the peel of an organic orange. Using a grater, shred the skin of the orange onto a parchment lined baking sheet. Spread orange peel evenly on the baking sheet and put in the oven to dehydrate for 25-30 minutes or until hardened and all moisture is removed from the peels. 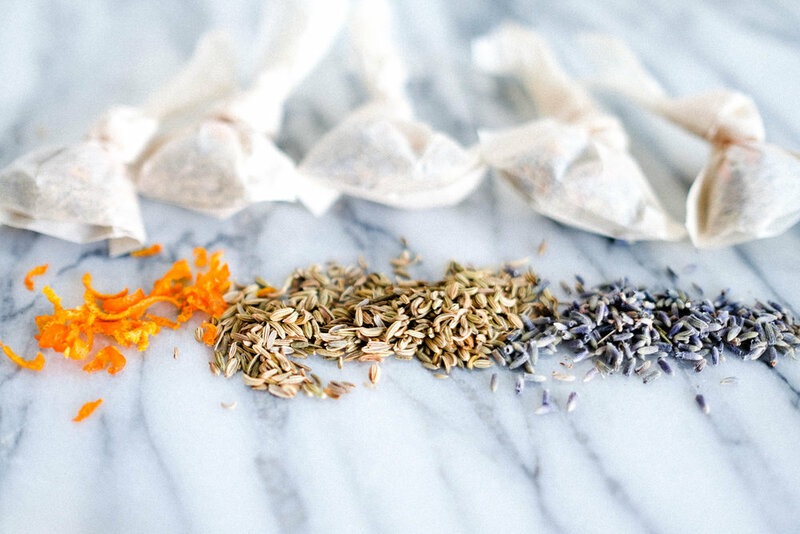 Spoon fennel seeds, lavender, and dried orange peel into a looseleaf tea bag. Carefully tie the top of a bag in a knot. Repeat until you've made enough tea to fill your mason jar. Keep covered until ready to use. Place Stress Free Tea in a mug. Add hot water. Let steep for 3-4 minutes or to desired strength. As you can see, making your own tea opens up a whole new world of exciting possibilities! If this flavor combination isn't to your liking I encourage you to try different things—drying lemon peel, ginger, lemongrass, or using other herbs and spices—until you come across a mixture that fits your palate and your body's needs. Also, homemade teas make a great gift! 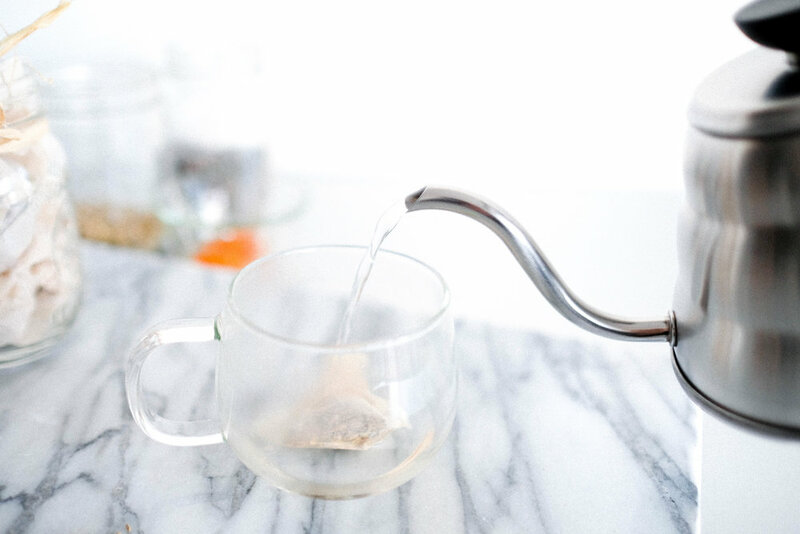 “drink your tea slowly and reverently, as if it as the axis on which the world revolves” — Thich Nhat Hanh.